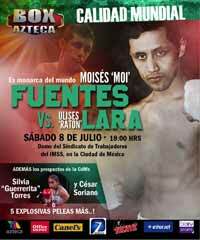 Review by AllTheBestFights.com: 2017-07-08, nice exchanges between Moises Fuentes and Ulises Lara: it gets three stars. The former world champion in two different weight classes Moises Fuentes entered this fight with a boxing record of 24-3-1 (13 knockouts) and he is ranked as the No.15 super flyweight in the world. He fought twice last year beating Rommel Asenjo (=Fuentes vs Asenjo) and losing to Kosei Tanaka (=Fuentes vs Tanaka). His opponent, Ulises Lara, has an official record of 17-15-2 (10 knockouts) and he entered as the No.17 flyweight. He defeated Javier Menodza last year but then he has lost to Maximino Flores in 2017. Ulises Lara vs Moises Fuentes is the main event of the evening. Watch the video and rate this fight!